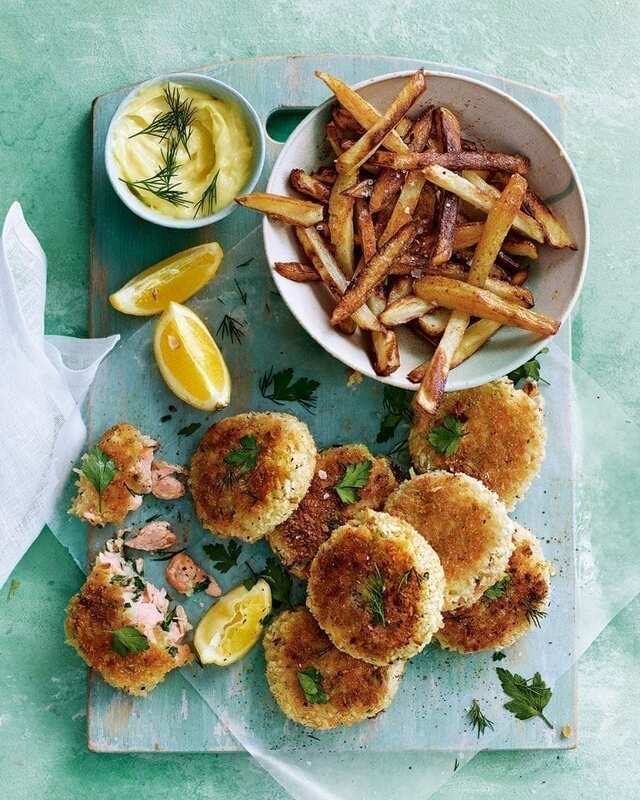 Forget fish and chips, we’re all about these easy hot-smoked salmon fishcakes served with a zingy mayo and chunky homemade chips – perfect for a warm summer evening. To make the fishcakes, boil the 500g potatoes in a pan of salted water for 20 minutes or until soft. Drain well, then put back in the pan and leave for a few minutes to steam dry. Mash with the butter, then transfer to a medium mixing bowl and set aside to cool slightly. Roughly flake the salmon into the bowl with the mashed potatoes, then mix in the lemon zest and juice, herbs, spring onions and some salt and pepper. Shape the mixture into 8 equal-size fishcakes. Put the flour, beaten eggs and breadcrumbs into 3 separate shallow bowls or plates. Dust each fishcake all over with the flour, dip into the beaten egg, then finally coat in breadcrumbs. Put the fishcakes on a baking sheet lined with non-stick baking paper, then chill for 30 minutes or up to 48 hours. To make the chips, heat the oven to 200°C/180°C fan/gas 6. Spread out the cut potatoes on 1 large or 2 smaller baking trays, season with sea salt and the smoked paprika, then drizzle with a glug of rapeseed oil. Toss well to coat, then bake, turning now and then, for 30 minutes or until crisp and golden on the outside and fluffy in the middle. While the chips are cooking, make the mayonnaise. Using a balloon whisk, beat the egg yolks and dijon mustard in a medium bowl. Season, then keep whisking briskly as you pour in the olive oil in a very slow, steady stream. Once three quarters of the oil has been incorporated, add the lemon zest and juice and the remaining oil. Whisk until combined. Add 1-2 tbsp water to give it a spoonable consistency, then set aside in a serving bowl until ready to serve. Heat a glug of oil in a wide frying pan until it starts to shimmer. Fry the fishcakes, in batches, for 4-5 minutes on each side until golden brown and heated through. Wipe out the pan with kitchen paper and add more oil between batches if necessary. Scatter the dill over the mayo and serve with the fishcakes and chips, with lemon wedges to squeeze over. If you like, scatter over extra parsley to garnish. When making the mayo (step 5), put a piece of damp kitchen paper under the bowl to stop it moving about. Or open-freeze the uncooked fishcakes on a baking sheet, then put in a sealed freezer bag and store in the freezer for up to 3 months.